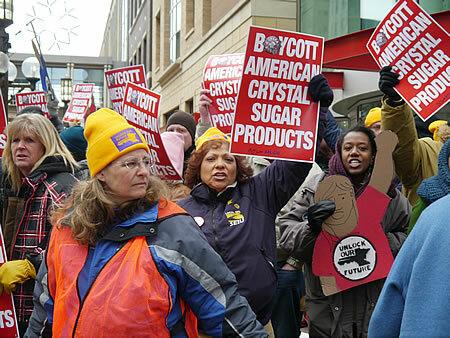 Members of community groups joined locked-out workers from American Crystal Sugar at a rally on March 1 at the downtown Minneapolis Target store to demand the retailer boycott Crystal Sugar products. Nineteen months ago, Crystal Sugar locked out 1,300 members of the Bakery, Confectionery, Tobacco & Grain Millers union at its sugar beet processing plants in Minnesota, North Dakota and Iowa. Target is one of Crystal Sugar’s major customers, sold under the Market Pantry brand. Members of Minnesotans for a Fair Economy and TakeAction Minnesota joined BCTGM members at the demonstration. They called on Target CEO Gregg Steinhafel to put pressure on Crystal Sugar to end the lockout. “I like sugar in coffee – and union workers in the factory,” participants chanted. “We are the 99%!” They marched from the downtown store to Target headquarters, carrying signs, chanting and singing. Ann Klemetson, a locked-out Crystal Sugar worker from Hillsboro, N.D., was grateful for the support. “It’s just been so difficult,” she said. “Our whole community is suffering” because of the lockout. Klemetson and her husband have both been employed at Crystal’s Hillsboro plant since the 1970s. “We just want a way to sustain our families,” she said. Friday’s rally was part of a week of action coordinated by several organizations to focus on the need to rebuild the middle class. Other events have put a spotlight on Target’s hiring practices and low pay for the workers who clean its stores. > The article above was written by Barb Kucera and is reprinted from Workdayminnesota.org.